Congratulations to the new Miss Universe, Iris Mittenaere of France! The 24-year-old aspiring dentist is the second Miss Universe to come from the country, after Miss Universe 1953 Christiane Martel. At the press conference immediately after her crowning, Iris gracefully answered some questions from the media. Here are just a few things we learned from her. "When I was on my first year of medicine, I didn’t have my first year (I didn’t pass.) I said, ‘I have now to do it again.’ [But] after I saw that I wasn’t on the list, I immediately bought a new book for medicine and I studied. One week after this, they called me: ‘Actually, you have your first year of medicine. This is not a joke. You succeeded.’ This is the thing that I am the most proud of [in] my life." "I think this is a difficult question, and I wanted to answer with my heart. In French, we have three words: freedom, equality, and fraternity. We have people for the opening of our borders, and people against. I don’t want to choose. I [represent] all these people." "I really want to bring all the children [to] school. This is one of my charities and I think this is the most important: education for every [child] and especially for young women, because I have the chance to live in France and to go to school to every morning and I think every [child] should have this chance." "I think this is very important, and this is a problem in every country. I think this is perfect for a person who represents the world. I really want to ask all the people to get tested. This is a medical problem that I know the treatment is difficult [for]. I really want to tell everybody that is this is a very important problem, and that you have to get tested—not just for you, but for all the people that you love." "I was very surprised. I’m always touching the crown and [thinking], Oh my god, I have the crown on my head. I don’t believe it. It was a big surprise—every step was a surprise—and I wanted to cry at every step. And I’m very proud. I feel blessed." "I really want to be a good Miss Universe, and I really want to meet you all. I love you so much. And thank you to all the Filipinos, because you are all exceptional. You are so welcoming and so lovely. It was amazing. I think all of the girls during the pageant loved you." "Yes, Miss Universe was a dream. Every girl, every miss want[s] to be Miss Universe. And, you know, last year, when Flora [Coquerel] went to Miss Universe and was in the Top 5, I watch[ed] her and I [said], ‘Oh my god, I want to do the same thing;’ Thinking, ‘This is amazing! The stage is amazing! Everything is amazing!’ And when I followed Pia during this year, I saw all the thing[s] that she did and I want[ed] to do that also. I want to help people. I want to understand people. I want to travel and meet people. And that’s why this is a dream for me to be Miss Universe." "France and Europe really need Miss Universe, because there’s a lot of time [we didn’t] have [a winner for] Miss Universe. And I think they need Miss Universe because French people love beauty pageants, but they don’t really know Miss Universe because our country never [wins]. And I think this year, a lot of people will know and will watch Miss Universe. 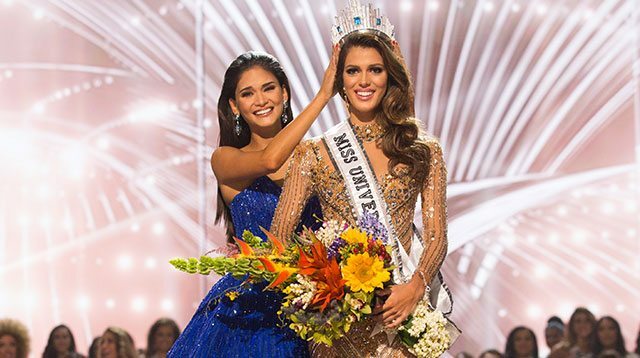 And I think French people will love [the pageant] now, and every year they will see and watch Miss Universe. And I think Europe will love Miss Universe, too. I’m very proud to bring this crown in Europe." "I think we don’t change the preparation(s). You know I really love being on the stage and I really enjoy this moment on the stage. Maybe it is this that [made me win]. We [didn’t] change our preparation. We [have] a good preparation in France. And I want to say thank you to my two coaches. And maybe [now], Europe will have a lot of Miss Universe." "Everything was very good in the Philippines, especially the mangoes. But the most important for me was Cebu. It was just amazing, and I loved this day… I saw for the first time a lot of drawings. It was a great experience for me to discover the talent of Filipinos."